I was excited to meet Janice and Chris who arrived all stiff and puffy-eyed after a 24-hour flight from Cape Town. 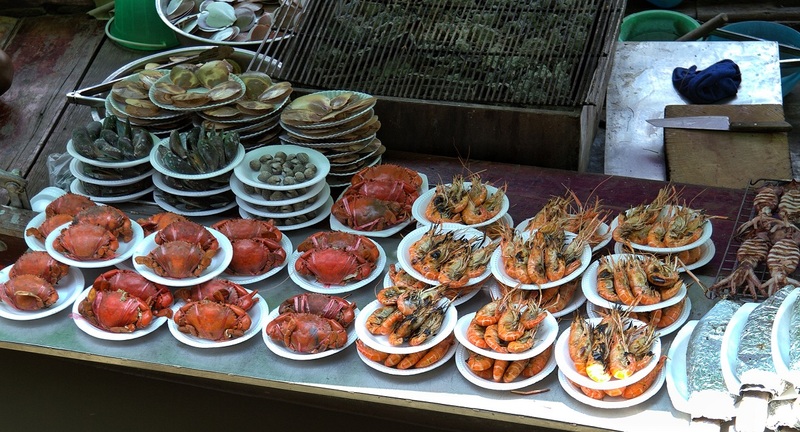 We wasted no time at all to explore the Khao San Road area where we drank a few beers and ate a few bugs. Yes, we did indeed try cricket, frog, silkworm and grasshopper, all served with a spray of soy sauces and a dash of pepper. For Janice, it was familiar territory, and it seemed that Chris enjoyed the madness of Banglampu as we strolled the crowded streets, nibbling from food stalls. Janice and Chris spent the morning putting their bicycles back together. As the guesthouse where we were staying was closing at the end of the month, they could not leave their bike boxes there, and we went looking for another guesthouse where we could store their bits and pieces until their return. That evening we did my budget “sunset cruise” on the River Pyraja, meaning that we caught the late ferry to its final destination and boarded the last boat back to our abode. All this for 30 TB. We were lucky, and it was a beautiful evening. We snacked on a few nibbles from the night market and then settled in for our nightly beer. We were up at 6 am. I still don’t believe that, but yes, we woke up at 6 am. Off I went to explore Bangkok with my jet-lagged guests, LOL. We witnessed bare-foot monks collecting food and saw the sun rising over the Royal Palace. It was a real privilege to walk the city’s ancient monuments without a soul in sight. Once back at our room we found a home for Janice and Chris’s bike boxes and then went on a little test ride to see how the bicycles were performing. 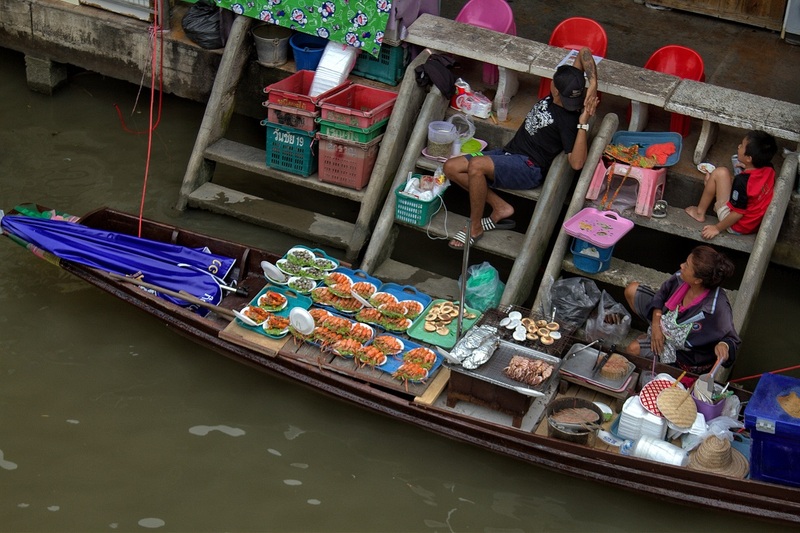 We weaved through the Bangkok traffic until it all got too much and returned to our guesthouse to explore the rest of Bangkok by river ferry and on foot. On our way to China Town, we popped in at the very impressive and newly renovated Temple of Dawn, always an awe-inspiring sight. Chris claimed that we must have walked at least 17 kilometres but, in truth, it was most likely more like six or seven. 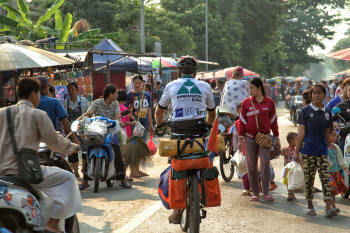 We arranged for “Taxi4bikes” to pick us up and take us 30 kilometres outside the city in the direction of Ayutthaya. I was impressed with the service as, firstly, the driver phoned to let us know that he was stuck in traffic and would be 30 minutes late. On his arrival, he had a roof rack that could accommodate three bikes. We had to, however, remove the front wheels and he also had three wheel covers. The taxi driver dropped us at Rangsit station, making for an easy escape out of the city. We loaded our bikes with the help of many onlookers and helpers and were soon on our way. Whoo woo! The fun had begun! It took us no time at all to find the small roads. 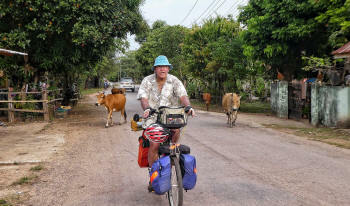 From Rangsit Station to Ayuthaya was a short and lovely rural ride through typical Thai countryside. 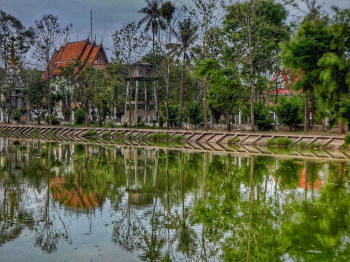 At first, we followed the Prem Prachakon canal past temples, simple eateries, and canal-side villages. 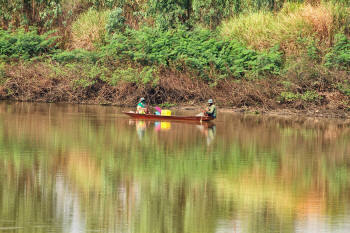 We watched people going about their daily lives, fishing, preparing food, worshipping and working in the rice paddies. 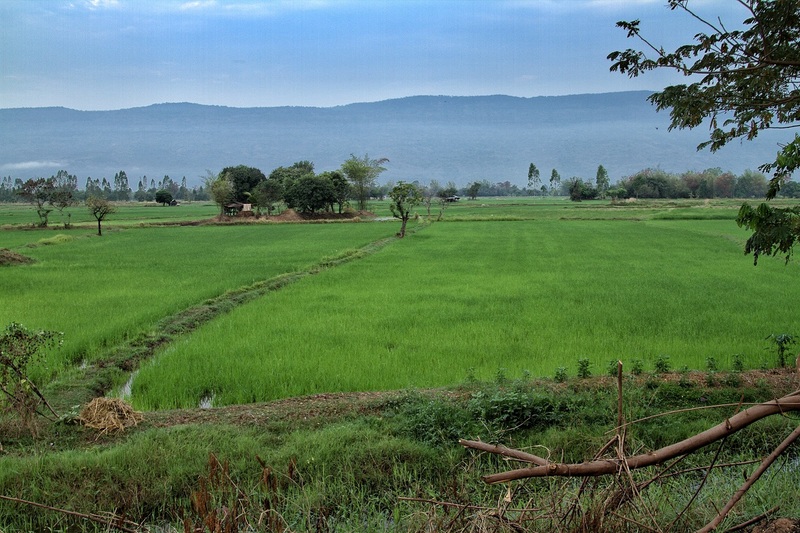 We ambled along, slowly enjoying views of bright green rice fields, banana plantations and the odd ancient ruin along the way. On reaching Ayuthaya, we headed straight for Baan Lotus Guesthouse, a lovely old wooden schoolhouse building on large grounds. After a quick shower, we were off to one of the restaurants for supper and beer. We decided to leave as early as possible to try and beat the heat, and we were on the road shortly after 7 am. I was pleased with our early start, even though I'm a late starter. The light was beautiful, and it was good to be out in the cooler morning air. No sooner had we left, and we were already on the smaller roads. 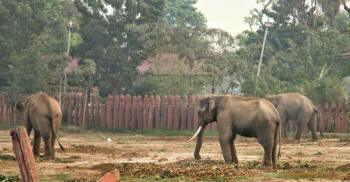 We cycled past the elephant kraal, and I felt sorry for those lovely animals, all chained and domesticated. I understand just too well that it is a practice that has been part of the Thai culture for millenniums. Still, I don’t like it or support elephant rides. We continued on the back roads through farmlands, and although it was early, it was already hot, making for challenging riding, especially for new riders. The route also became far too busy to my liking, and we soon turned off onto an even smaller road. It turned out to be a lovely ride as we cycled past bright green rice paddies, fish drying in the sun and large Buddha statues. In fact, the road was so small it turned to a narrow dirt road. Fortunately, we found a paved road again, and then it was onto Lopburi where we arrived around 14h00. It was Chinese New Year, and we strolled the crowded street with 1000’s of others enjoying all there was to see. Most people were beautifully dressed in traditional Thai costumes, and all the historic ruins were lit and open to the public. What a sight it was. 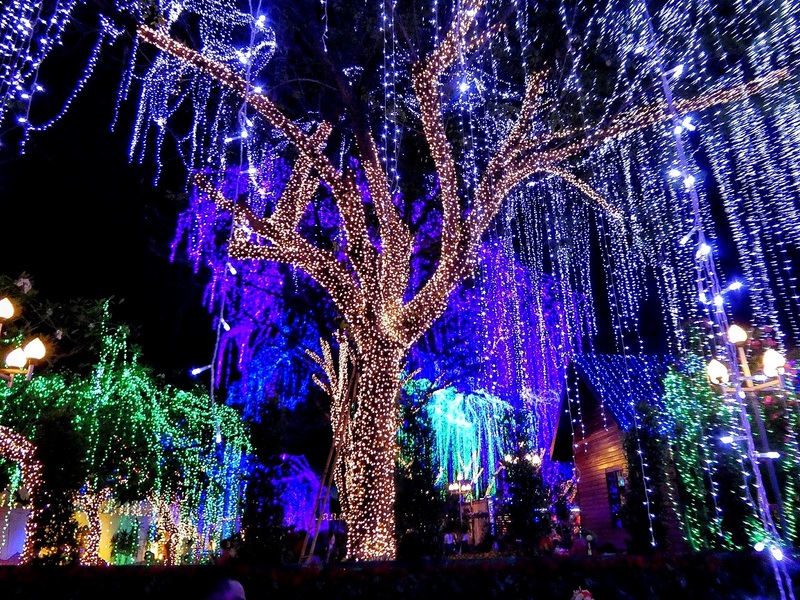 All the trees were covered in fairy lights, and visitors were entertained by cultural shows, music and fireworks. The weather forecast predicted a high of 38˚C and we decided to stay put for the day. 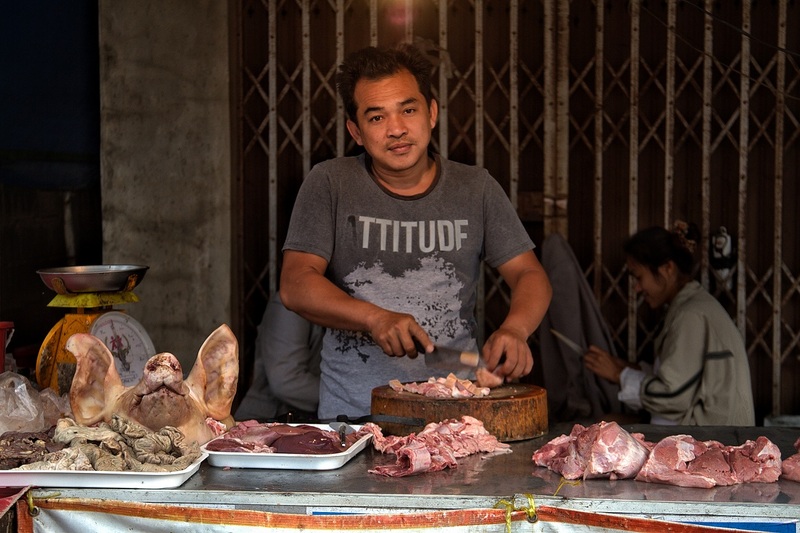 Chris was finding the heat exhausting and, as 38˚C was hot by anyone’s standards, we spent the day in Lopburi where the New Year’s celebrations were still underway. We also each invested in a typical Thai hat to keep the anticipated heat off our heads. I don’t know if it will work, we will have to wait and see. The rest of the day we used for updating photos, journal entries and catching up with friends and family at home. Although the weather prediction is 37/38˚C for the next few days we will move on in the morning. 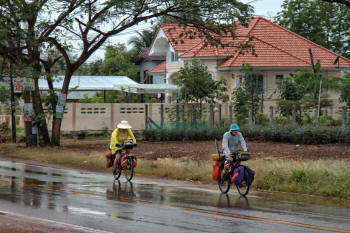 We left NooM Guesthouse as soon as we could to take maximum advantage of the “cooler” morning air. I say “cooler” as in fact it is not much cooler in the morning than later in the day. Along the way, we stopped at an organic market that sold interesting food and herbal products. Again, it was a scorcher and we stopped as often as possible and, in the process, met some interesting people. Towards the end of the day we reached Pasak Jolasit dam, and although it was still early, we decided to camp there for the night. It was a fantastic spot to put our tents under the trees, and with a great view of the dam and a short walk from the ablutions. After sunset, we took a stroll to the restaurant located outside the gate of the dam's recreation area and had a fantastic meal without being able to speak a word of Thai or read the menu. It was a pleasurable ride along the opposite side of the dam past large areas of sugarcane fields as well as cassava plantations. Our first stop of the day was at the dam’s White Buddha. We cycled along, passing workers busy cutting the sugarcane and we wondered what all was hiding in those fields; rats, snakes and many other things I guess. At around 11h00 we reached a waterfall where we bought a watermelon and spent some time soaking our feet in the stream. We ate our watermelon and enjoyed the relative coolness of the picnic area. Soon it was time to saddle up again, and we headed further north. Janice had the first flat tyre of the trip, which took surprisingly long to fix. Soon after fixing the flat it was time to start looking for a place to pitch our tents. Wat Nong Bong (a Buddhist temple) came just at the right time. We stocked up with food from the smalls store across the road and then asked the monks for permission to camp at the temple. It was a very welcoming temple, and the monks pointed us to the Wat (temple) where they gave us sleeping mats and requested us to speak to the students about our trip in the morning. Janice was appointed to do the talking and Chris cooked our instant noodles on his small stove, which we ate while listening to the monks chanting their prayers. We were fed breakfast by the monks, a simple but delicious dish of fried noodles. Janice (as requested the previous night) spent a few minutes talking to the school kids about our trip. Afterwards, we attempted to adjust the disc brakes on Janice’s bicycle. None of us knew anything about disc brakes, but after “YouTubing” we managed to free the wheel and were on our way. Thank you, YouTube! 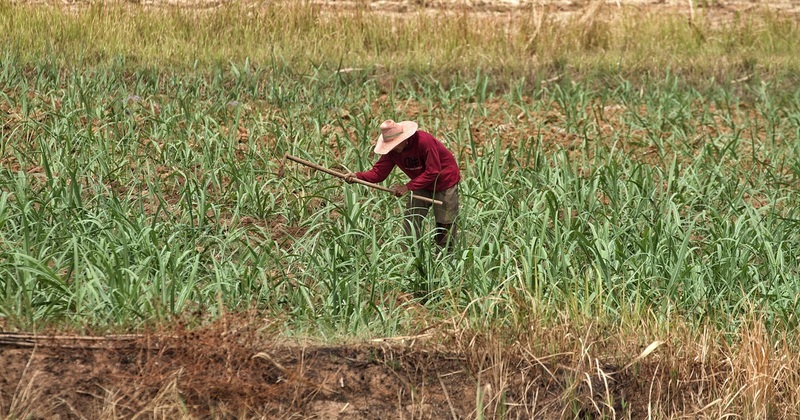 We continued north and, like the previous day, we passed large sugarcane plantations. 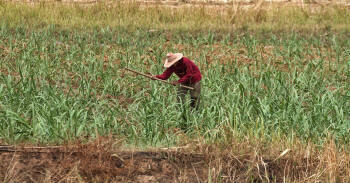 It is harvesting time, and we saw many large trucks with sugarcane heading for the market. The plan was to cycle 34 kilometres to the Si Chep Historic Park and then continue for another 30 or 40 kilometres after that. Chris, however, found the heat unbearable and we hung around in the shade at the Historic Park until 16h00. It was not a bad way to spend the afternoon. 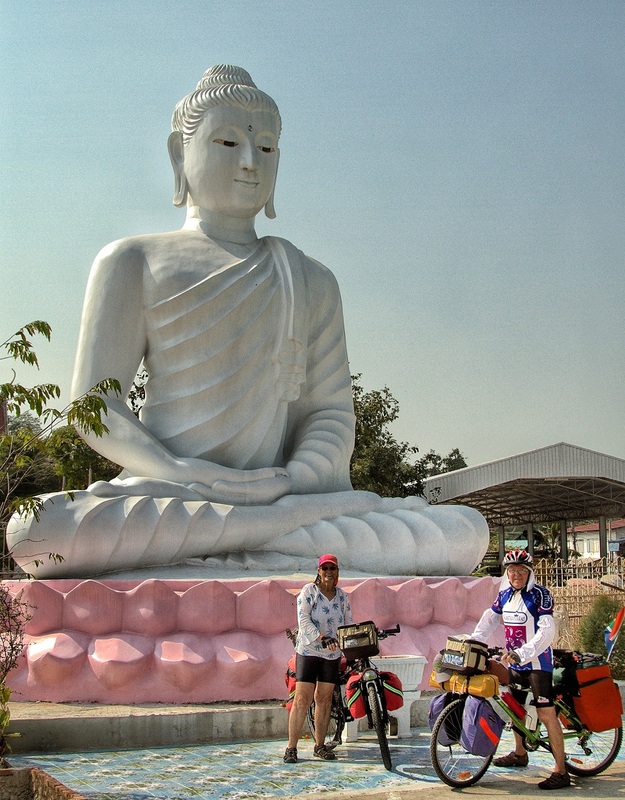 Chris still had enough energy to cycle a further 10 kilometres to where we found another Buddhist temple. 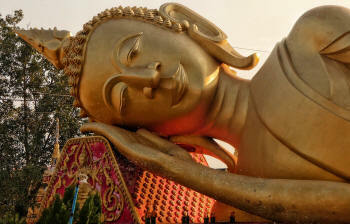 The friendly monks allowed us to sleep in the Wat and even gave us mattresses as well as pillows. The temple dogs were, however, not so friendly. After a serious discussion, the original route was changed and shortened to 50 kilometres a day, starting at 7h00 and ending the ride at around 11h00. Wild camping at 11h00 in the heat will be a challenge, but I'm convinced that we will manage. There is always a plan to be made. Our nightly camping spot mostly depends on where we can find ice, which Chris needs to keep his diabetic medication at optimum temperature. Even with all these challenges, I’m sure that we can make this trip work to the enjoyment of all! Tomorrow is a new day and a new challenge. We were up at the ungodly hour of five in the morning. We packed up in the dark, and by the time it got light, we were ready to roll. The things I do for friends! LOL. 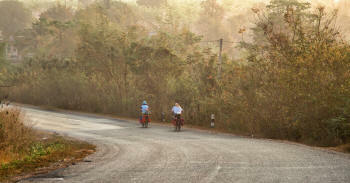 We waved goodbye to the monks and rode along slowly, with the sun peeking through a smoky haze. We cycled together along back roads and through farmlands, passing villagers cutting sugarcane by hand and dodging muddy puddles from the previous night's rain. We stopped every so often to take a break to give the backsides and shoulders a rest. Our little back road turned into a dirt road, which we followed along with two-wheel tractors, trucks, and monks collecting food. By 11h00, we had managed to do only 38 kilometres, but as arranged, we ended the day's ride and found a conveniently located roadside gazebo to rest under. We hung around under the gazebo till 15h00 and then cycled to the nearby temple to ask permission to sleep there for the night. Although this was much earlier than I like to do this, we had had enough of sitting by the roadside. The temple was a very basic one, with only one dusty undercover area and a large dirt yard that was swept continuously. The sweeping caused more dust than the few leaves gathered there were worth. Cleaning the undercover area kept us busy for a while. We dusted the Buddha, lit a few incense sticks, and settled in for the long night ahead. For the first 15 kilometres, the road leads straight up the mountain, where we encountered a few steep inclines. It was a slower than usual process as we edged our way higher and higher. After about 10 kilometres, we turned off onto an even smaller road to avoid crossing the high pass, but it was still a pushing-up-the-hill day. Once I reached the top of a hill, I would run down and push Chris’s bike up the hill, then cycle my own up the next hill and run down again, LOL. It was, however, a stunning ride on a rural road, past tiny villages where locals stared, slack-jawed, as we made our way down the pass along the muddy track. In the process, we passed small settlements with basic wooden houses on stilts. Families were swinging in hammocks underneath the homes while kids ran amok and livestock had the run of the place. Soon, we found our way back to a paved road with stunning scenery in the distance. We could see the higher mountains to our right and were pleased that we had not taken that way. 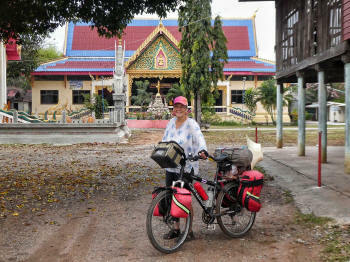 At around 15h00, we cycled into the tiny village of Ban Non Sa-at, where we found a temple in which to spend the night. Like the previous night, we swept the half-covered hall, dusted the Buddha, and lit a few incense sticks. I ate my noodle soup that I bought earlier in the day, Janice, not being a big eater, only had a small tin of sardines in tomato sauce (she claimed she also had a quarter pack of instant noodles), and Chris enjoyed cup noodles with a tin of sardines. My humble (or not so humble, LOL) opinion is that this is not enough for a full day of cycle touring. 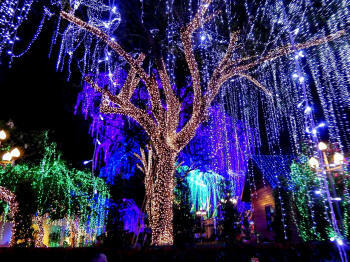 We can, however, only eat what we can and each person must do what is best for them, I can just give advice. The early morning wake-up call was getting to my guests as none heard the alarm go off. It was still bucketing down with rain when we rose at past five. There was, however, enough time to pack up and be on the road by 7h00. We donned our plastic raincoats and set off in a drizzle. It was a slow process as we ambled along an excellent paved road, the slight breeze kept us cool, and we stopped every 10 kilometres or so to stretch our neck and shoulder muscles. At one of the many roadside stalls, we bought a watermelon, and that went down rather well. The shop owner also gave us a bag of bananas, making for an impromptu fruit salad. 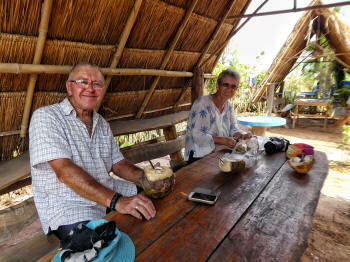 Around midday, we stopped for our usual noodle soup, after which we carried on to the tiny community of Ban Huabua. 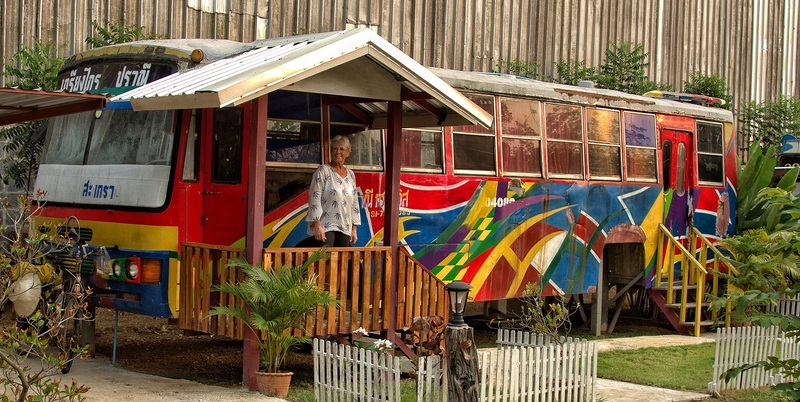 I don’t think any foreigner has ever stayed overnight in Ban Huabua. Even the local temple was abandoned. Eventually, we found someone to ask if we could camp under a wooden structure on stilts, situated on the corner of the property. By the time we were ready to eat, even the roadside restaurants were closed, and we had to make do with our usual cup of noodles. The colder weather made for a lovely but nippy early morning ride. Chris was on fire and set off at a good pace with Janice and me in tow. 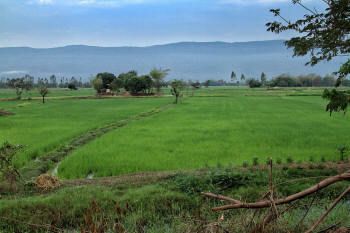 The early morning light made the colours pop, and the rice paddies looked even greener than before. Lotus flowers reflected in muddy ponds as we made our way past smoky early morning food stalls. 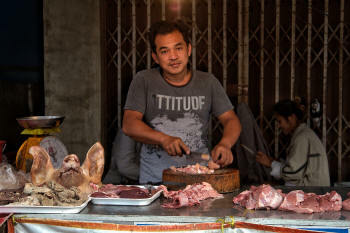 Butchers were selling meat on the pavement while farmers carted long-eared cows to the market. We made a good time stopping at regular intervals to fill up with water. Around lunchtime we stopped for a bite to eat, Chris had a quick nap after which we continued to Ban Thaen, stopping for coconut juice along the way. We reached Ban Thean around 4 pm, found a Buddhist temple and asked the chap sweeping the yard if we could camp there. He indicated that he understood what we said and pointed us to an undercover area where we could sleep. We were not entirely sure that this was permission, but after what appeared to be a long time, the head-monk arrived. The monk indicated that it was OK and we settled in. I walked across the road and found a small shop selling food. I bought a soup as takeaway and later discovered that the soup contained a rather unusual animal. It was extremely bony but delicious; all Thai food is delicious. "Aroi mak mak!" as they say in Thailand. It was a warm night, and none of us used our tents, only our sleeping mats. The mozzies did not seem to be a problem as we had a few mosquito coils going and even the temple dogs stayed away. One hardly ever oversleeps at a temple as the gong is sounded at first light, announcing the time to wake up. This also seems to get the temple dogs howling, and even the deepest of sleeper will be woken by the racket! As we did not have to take our tents down we were quick in packing up and in time to witness a most stunning sunrise. What a fantastic t ime of the day it is to be out. Chris was thankful for the cooler morning air and Janice and I were happy to take full advantage of the morning light to practice our photography. We opted for the rural road instead of taking the main road to Khon Kaen. 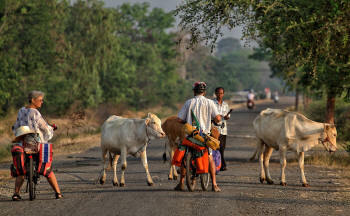 The path led us through the tiniest of settlements where both water buffalo and cows were still kept in the front yard. It was Sunday, and the village folk were going about their Sunday chores, some doing necessary household maintenance and another foraging for food or making charcoal. In the process, we met some lovely people, albeit not able to speak to any of them. By lunchtime, it was however hot again, and we stopped to take a break at a very conveniently located 7/11. Then it was onwards to Khon Kaen where we found a bicycle shop for me to have my front wheel seen to that had a slight wobble. Once that was sorted, I paid the small amount of 20 Thai Baht, and we cycled into the centre of town where we found a hotel room for a change. We spent the day doing laundry, shopping for headlamps and going back to the bicycle shop to add a headset extension to both Janice’s and Chris’s bikes. That evening Chris made us some Cape Velvet Liqueur, lovely stuff. We were on the road before 7h00 and all felt fresh and energetic with the result that we went too far and too fast. We followed the main road, something that never makes for very exciting riding. It, however, came with large amounts of facilities and we passed a multitude of fuel stations, all with food and ablution facilities. The roadside stalls mostly sold bamboo craft and furniture and, once again, I was amazed at the strength of bamboo. I much prefer Chris to ride up front, allowing him to set his own pace and stopping whenever he feels the need. After our 50-kilometre break, I took the lead and after a toilet stop I discovered that there was no one in sight. I was convinced that they did not overtake me but I could see no one behind me. I cycled back along the road to a high point and still there was no sign of either Janice or Chris. I phoned and sent messages but no one answered or replied. Eventually, I flagged down a motorbike who informed me that they spotted two cyclists a few kilometres back. Phew, at least they did not disappear; instead, Chris had decided to take a nap, which I was unaware of. 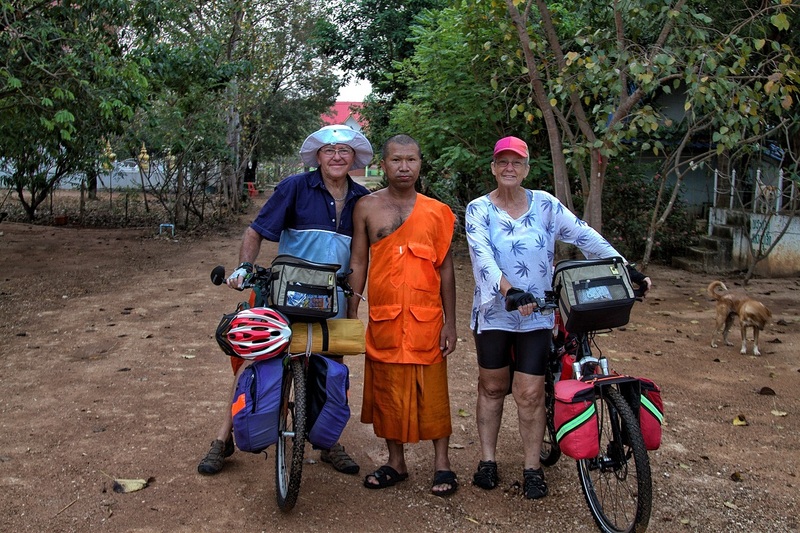 Eventually, we met up again and cycled the last few kilometres to where we could find a Wat to camp. Chris was exhausted and went straight to bed. I had a feeling that there was a communication gap, both in frequency of stopping, distance and overnight accommodation, even though the next day’s route is discussed and send to all. I will try and make it clearer from now on. An uneventful day. I will not go into detail but this trip is going pear-shaped. My guests are accusing me of being verbally inept and take offence that I send daily messages of what to expect the following day. The reason I do this is that guests can look back to see what is planned for the following day, a tool especially handy for a person who is verbally challenged! I, therefore, do not see why someone should be offended by the messages, instead they should be thankful. To be quite honest, I just about had enough of the verbal abuse and I do not tolerate people insulting me or speaking to me in an aggressive tone of voice while I’m doing someone a favour. Everything done so far was to make the trip as comfortable and enjoyable as possible for everyone. From getting up at some ungodly hour of the morning so we could cycle in the cooler morning air, to sitting in the shade next to the road in the heat of the day. I bought hats and suggested wetting cloths and hats, I urged everyone to eat and drink sufficiently. I pushed Chris’s bicycle for him up the hills, I cycled at 8km/h and allowed Chris to take the lead so he did not have to feel pressurised. None of this was for my pleasure but it was purely as a favour to my guests. I’m not being paid for my service, it is just a favour I’m doing for friends. Here I must add that a detailed itinerary was prepared with a full description of the day, as well as a map of the route and daily distance. Not once did anyone come back to me saying that it did not suit them. I, therefore, excepted that it was a route and distance agreed upon. I understand fully that 80 kilometres a day and 34˚C does not sound undoable, sitting on the sofa in your lounge. I, therefore, have sympathy for anyone who comes to cycle tour in Southeast Asia, and I will go out of my way to make the trip as comfortable and enjoyable as possible. I will, however, not tolerate being used or insulted. 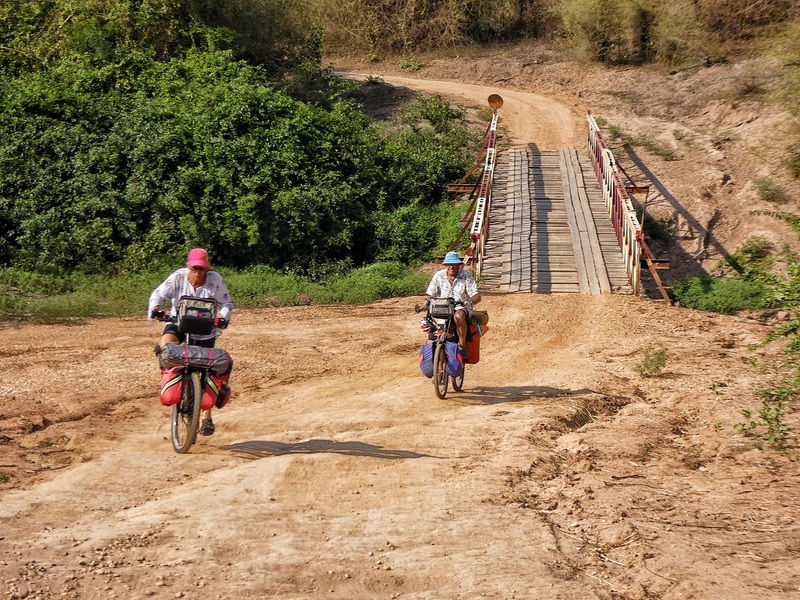 We cycled the 10 kilometres or so to the border and crossed the Mekong River into Lao and then discovered that neither Chris nor Janice was given an exit stamp. Their departure cards were not filled in and the officer told them to fill it in, which they did and left! LOL. We cycled back across the river, got the stamps and were soon back at the Lao immigration to get our visas. 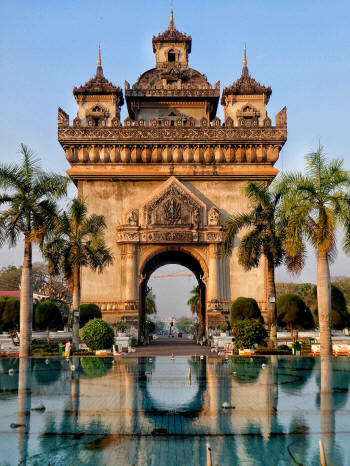 It was a short ride into Vientiane where we found a room and took a walk to get new SIM cards and explore the city. That evening we had a meal at one of the many restaurants along the riverfront. Even at 9 pm, it was still extremely warm and the weather forecast for the following few days did not look good for cycling, varying between 36 – 38˚C. It was extremely hot and we left early, stopping at the monument and the Wat. The road to the Buddha park was very bad so we gave it a miss and followed the main road. Chris did extremely well and we cycled to our destination without having lunch or a nap. Outside our guesthouse was a small local restaurant that served noodle soup and that was what we had. We met a few locals from Vientianne. If we did not leave, we would have become very drunk as they kept buying beer and offering it around. With the weather forecast indicating temperatures between 36 – 38˚C, we decided to leave even earlier than usual! I did not think that possible! Just after 6h00, we were on the road. Our first stop was around 15 kilometres, and about four kilometres later Janice discovered that she left her reading glasses behind. As it was a short distance back to our previous stop (about four kilometres), Chris and I continued while Janice cycled back to look for her glasses. After cycling another 15 kilometres, there was still no sign of Janice. After contacting her, we discovered that she could not find the place where we stopped, and in the process, she cycled all the way back to where we started! Chris and I continued slowly, hoping that she would catch up. The previous night we made the decision to cycle only until 13h00 and then find a guesthouse or campsite. Around that time, we found a roadside guesthouse where we waited for Janice to arrive. It was a rather long day on the road for her – 100 kilometres in all! Well done, Janice, on your first 100 kilometres and first solo ride! Your rock, girl! It is surprisingly cold in the early morning and I had to stop and buy a long-sleeved sweater along the road. Many of the roadside restaurants will have a rail of clothing but I was not sure if it was for sale or if it was their laundry, LOL. With us only cycling half days we were in the position of arriving at the temple very early. Asking to camp at such an early hour always feels somewhat awkward. The monk we spoke to pointed us to a room which we first scrubbed clean. Although the building appeared very new, the bathroom needed a good scrubbing. No sooner had we sat down and the head monk arrived and indicated that we could not sleep there but had to move to the basement. The basement area was a large tiled room which we, once again, had to clean. It was clearly a place where the down-and-out would overnight or otherwise one of the monks had a drug problem. We left our sparkling clean room shortly after 6h00, not even the monks were up yet. 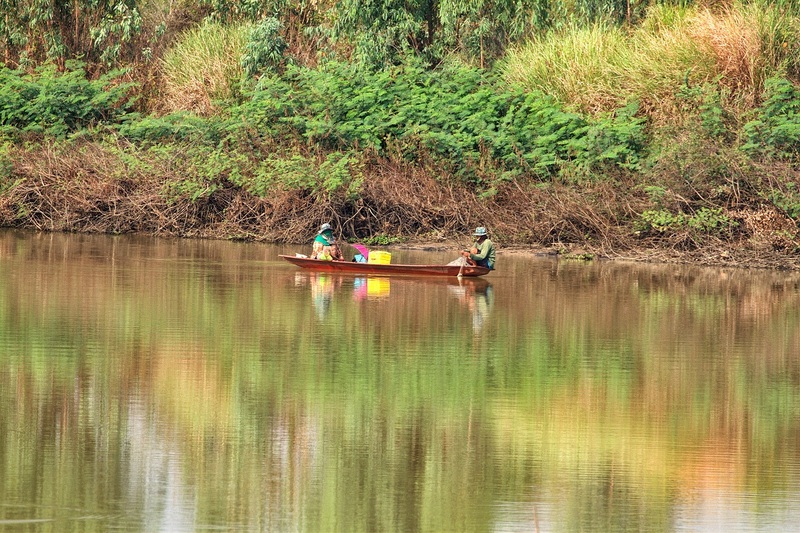 We crossed the Nam Kading river, one of the main tributaries of the Mekong River. The Pakkading Bridge is a Russian-built bridge where truck drivers often stop to light a cigarette before crossing the bridge and then throw the lit cigarette in the Nam Kading river. The reason being is to appease the water serpent that is believed to live in the river mouth. At first, it was cool and we also picked up a good tailwind. The favourable condition did, however, not last and soon it was another scorcher, this time with a headwind thrown in. 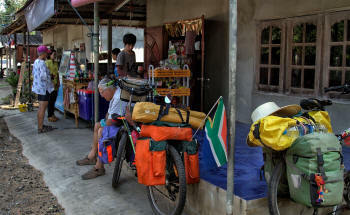 Around 13h00 we came upon a roadside guesthouse with a very convenient restaurant located across the road. We were up and packing by 5h00 and were on the road at first light. The road was gently undulating as we slowly made our way south, past friendly kids shouting, “Sabaidi falang”. Some seemed to be on the cautious side and kept their distance. We stopped at roadside shops for water and snacks and drank sugarcane juice along the way. We passed fascinating markets where stall owners sold Dung beetle balls with larva inside as well as grilled and raw rats and squirrel. Besides the usual crabs, eels and other fishy things they also sold live lizards by the bag-full and other exotic (or illegal) animals. Even though it was a short day, we still left early to make the best of the cooler weather. We stopped at the “Great Wall of Lao”, or Kamphaeng Nyak wall. 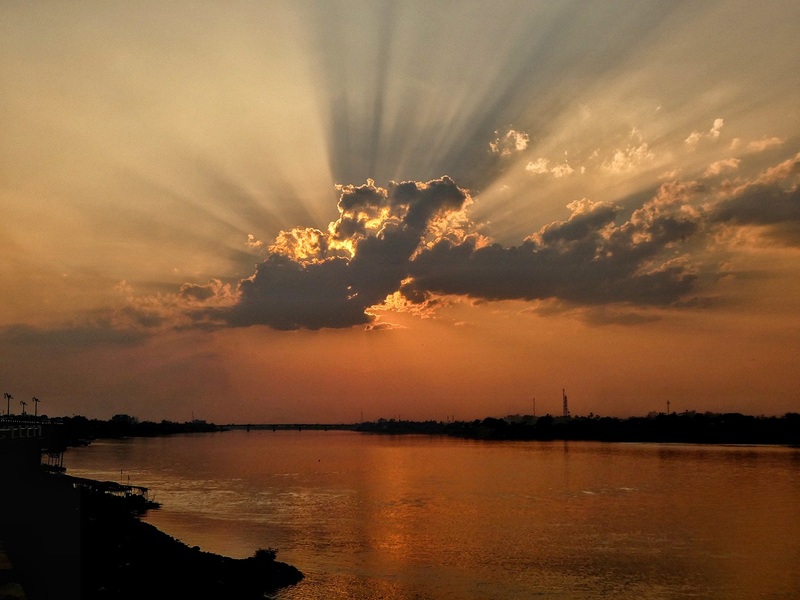 This is actually a geological phenomenon, but its physical resemblance to a man-made structure has given rise to many Lao myths, some claiming that it was built as a defence system and others claiming that it was built to stem the flood waters of the Mekong. 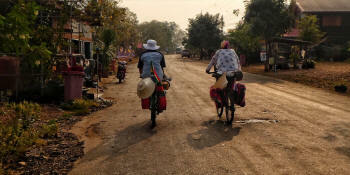 Close to Thakhek we turned off onto a smaller road and found interesting villages right on the Mekong. 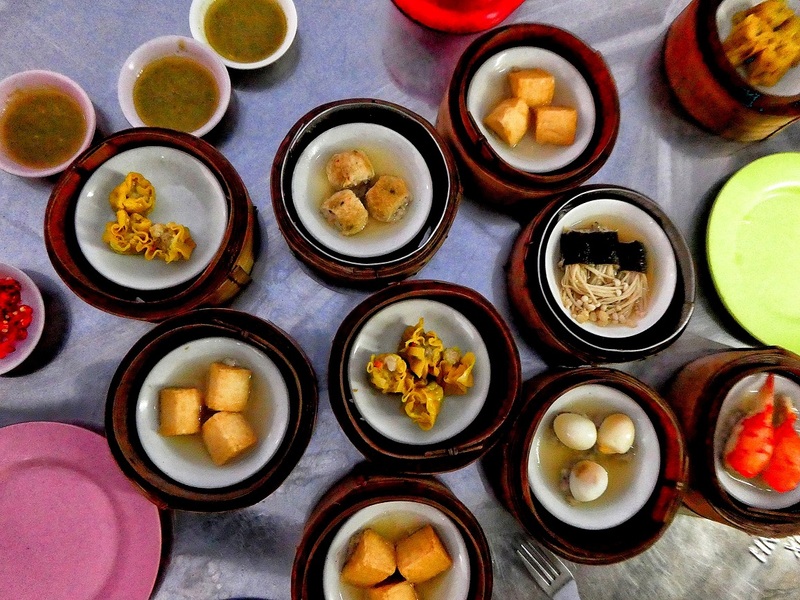 The Lao baguette or Khao Jee is one of the most famous street foods in Laos, stuffed with salad, pate, chilli paste and cold meats. The baguette is usually warmed on coals, making for a crispy and delightful snack. There is no better place to eat it than right there, on the pavement. We arrived in Thakhek early and found a room at the Souksomboun Hotel, situated across the road from the Mekong River. With outside motel style rooms, it’s perfect for cyclists, as we could wheel our bikes right into the room. The following day was a rest day, and we organised a tuc-tuc to take us to see a few of the nearby caves. It was a relaxing morning, and we were home by 14h00. We started bright and early again, intending to do our usual 60/65 kilometres. We followed the river road which turned out very interesting as we cycled through a multitude of small villages located right on the Mekong. We reached our target distance early, and no one seemed interested in stopping, so we continued. By midday, I thought we had reached our destination, but my guests were keen to push on. A short while further we reached the turn-off for a shortcut, which I had no intention of taking but once again Janice was the instigator and suggested we turn off. It turned out a bumpy and potholed road but an exciting route, making for a very adventurous ride. The last part of the day we pushed hard to reach Savannakhet before dark, which we did and I was happy that we all reached our destination safely. After a shower, we headed straight for the Night Market which, sadly, was not there anymore. We did, however, find the dim-sum stand and had more than our fair share. All in all, a lovely day on the road. 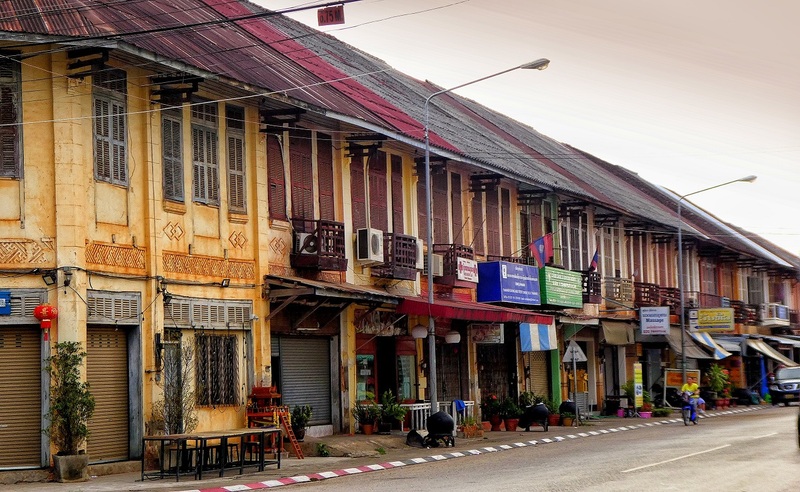 We spent a well-deserved rest day in Savannakhet, wandering the tree-lined streets and enjoying the old crumbling French colonial buildings. 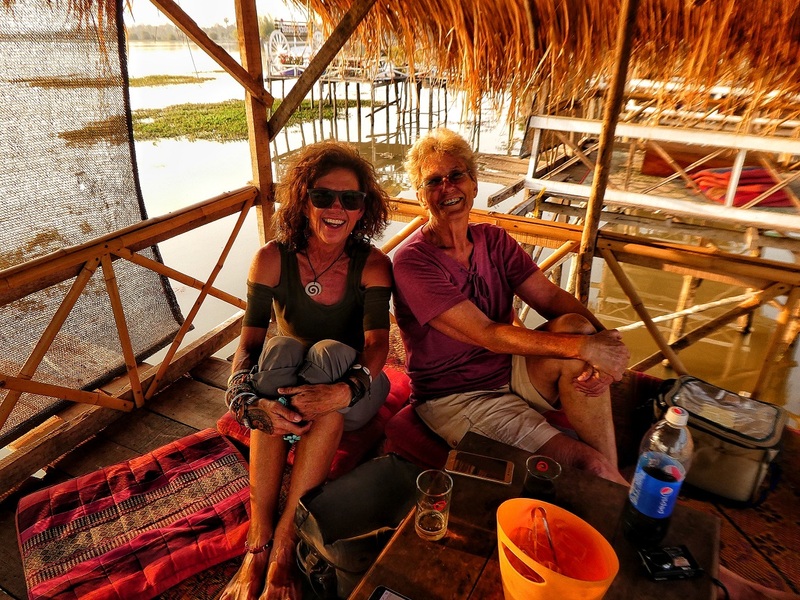 We intended to cross the border back into Thailand at the Friendship Bridge on the outskirts of Savannakhet, but I first wanted to apply for a Thai visa. As it was a Sunday, I could only do so the following day. The next morning, I was off to the consulate, handed in my application and as I could only collect it the following day, I headed back to our guesthouse. 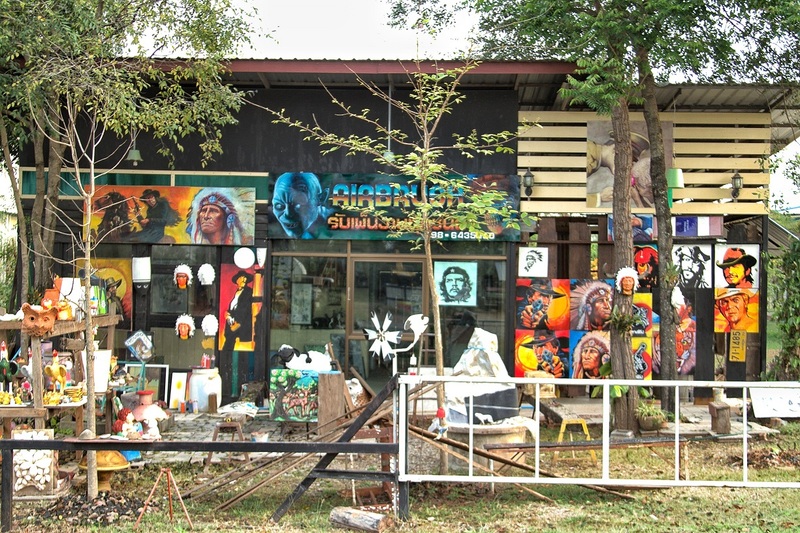 It was Chris’s birthday, and we walked around town, visiting the small museum that had interesting artefacts all collected in the vicinity of Savannakhet. Later that day, we had Chris’s birthday ride out to the nearby lake where we had a sunset meal on a wooden platform on stilts over the water. We ate while sitting on a woven mat, not the most comfortable arrangement for Europeans but Chris never complained. Afterwards, we had to cycle back along the potholed road and made it back just as it was getting dark. We packed up at leisure, as I could only pick up my visa after 14h00. Checkout from our guesthouse was at 12h00, and there was, therefore, no need to rush. We went for coffee and cake at a rather fancy establishment, just to pass the time. I cycled off to the consulate while Janice and Chris cycled to the border. I collected my visa and we met at the immigration checkout point. Cycling across the Friendship Bridge is not allowed (even though I have done it on more than one occasion). We bought our bus tickets and then waited for a bus. Two buses arrived, but none could take the bicycles. When the third one came, we were first in line and could load two bikes but not all three. I decided to make a break for the Thai border, and as the bus left, I sped across the bridge with border officials shouting and screaming. I pretended not to hear and made it to the other side without being chased down, LOL. Once through Thailand immigration, we cycled the short but pleasant distance into Mukdahan town, found a Buddhist temple to sleep at and then went looking for food of which there was no shortage. We were well rested and set off at a good pace. The road ran close to the Mekong River and albeit hilly at times, it was comfortable riding to the small village of Khemmarat. We headed for Wat Pho, where we asked for permission to camp, and they promptly pointed us to a lovely room. The room even had an air-conditioning unit! We found plenty of mats and pillows to sleep on and soon made ourselves comfortable. No sooner were we ensconced in our abode and the heavens opened up. We also discovered that there was a good reason why the mats were all piled up in the one corner. The roof was not only leaking, but the water came pouring in as if it was a misplaced gutter. We scrambled to get our electronics (which was all plugged into the by the wet sockets) out of harm’s way and moved our mats to the driest corner of the room. 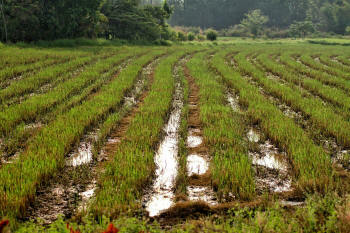 Fortunately, the rain in Southeast Asia comes quick and hard and soon it was all over. As was our habit by then, we woke at 5h00 and headed out at around 6h30. We followed a pleasant rural road past the smallest of villages. I'm always in awe of just how peaceful these communities are. 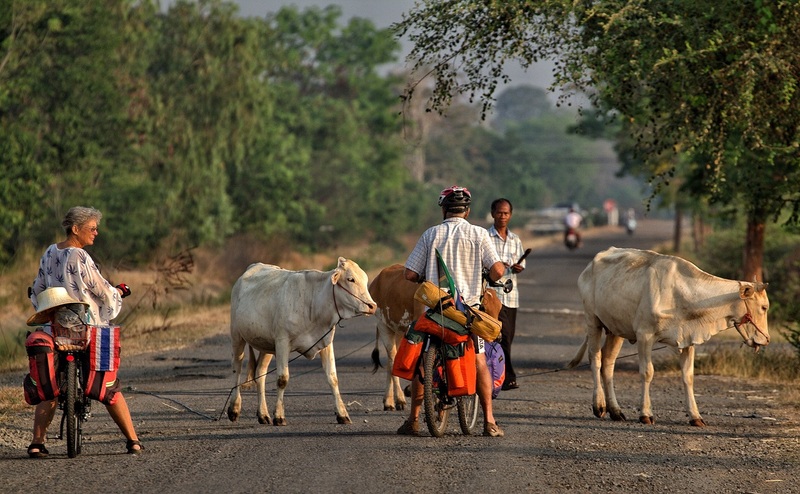 Cattle were grazing in backyards; kids travelled to school on tiny bicycles. Women sold snacks at roadside stalls and men where herding coats and cattle. We knew it was going to be a slightly hilly day, but by the time we reached Ban Pakhachomson we called a halt. I have cycled this route twice before, and if the first 35 kilometres was considered hilly, then I thought the rest of the day too demanding for my guests. 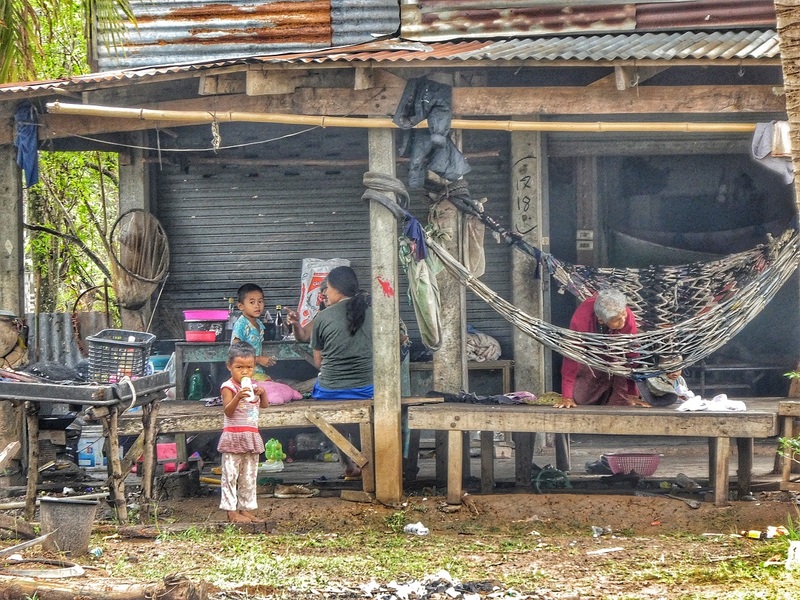 At the small village of Ban Pakhachomson, we waited at the local police station for a bus to Ubon. I reckoned it would be easier to get a bus to a big town than the smaller village of Khong Chiam, where we were heading. Although we were losing out on a lovely area of Thailand, it made it more comfortable for everyone. Emotionally, it was a very demanding day as I had to pull the plug on a planned route and was accused of mocking my guests, as I said that the section we had done since that morning (according to the MAPS.ME profile) was the “flat” section. Cycle touring is not always as idyllic as it appears on Facebook. Neither is guiding. Phew! 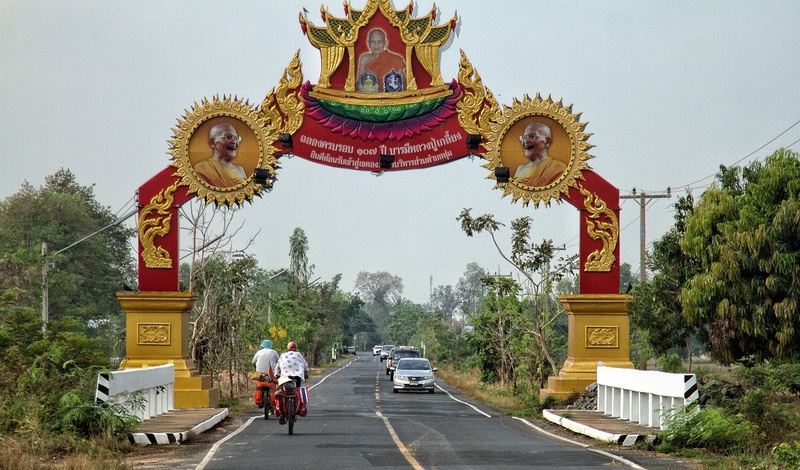 Once in Ubon, we cycled the six kilometres into the city centre, where we tried our luck at sleeping at two of the local temples, but without any success. It is always far more difficult to get permission to sleep at a temple in a big city, especially if there are plenty of guesthouses and hotels. Eventually, we took a room at the Ubon Hotel, right across the road from the night market. Albeit pricey, it was very conveniently located. It was also one of the few rooms where the water pressure was (nearly) high enough to blow me out the door. If I did not move very quickly, outstretching my arms and legs, I could have been blown right out the door into the passage! I’m not kidding you! It was a lovely day of cycling along small roads and rural settlements. On arrival in Si Sa Khet, we asked to camp at two of the city’s temples, but they politely declined our request. It is always far more difficult to sleep at temples in a big city, so we cycled about six kilometres outside the town where we found a more secluded temple. We were fortunate with the weather as it was overcast and perfect for cycling. We passed typical Thai rural scenery where scrawny cows with long ears were grazing in dry rice fields and smoke billowed from charcoal pits. We headed in a more southerly direction to the small village of Khun Han. 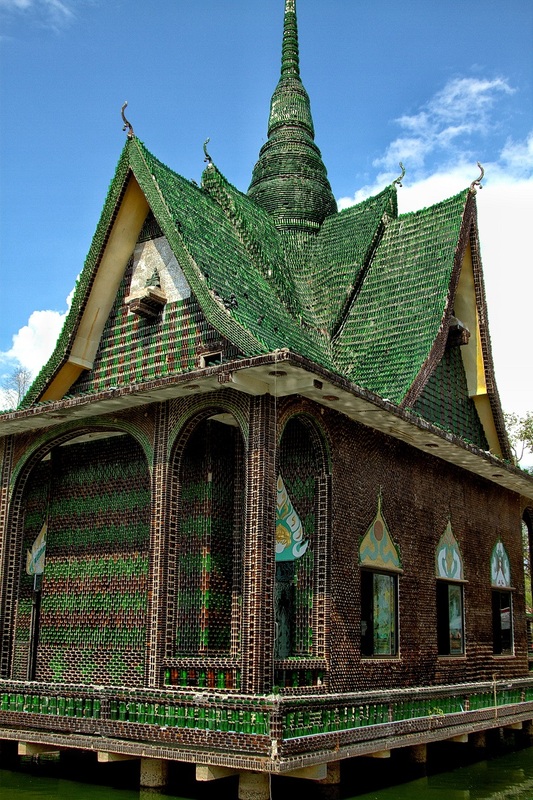 On arrival at Khun Han, we headed straight for the local temple known as Wat Pa Maha Chedi Kaew (The Temple of a Million Bottles). The temple is made of over 1.5 million Heineken and Chang beer bottles. The original temple was built in 1984, but the monks continued to expand the site, and now there are more than 20 structures, including sleeping bungalows and toilets. After our visit, we cycled off along the nearby lake looking for camping, but there was none to be found and headed to the local town temple where we could camp under a covered area. 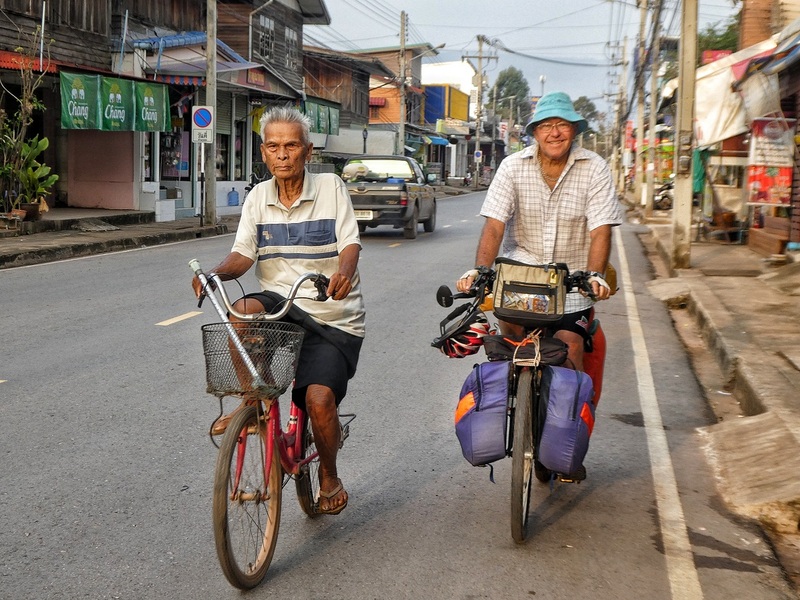 We rolled into Surin just before six and after cycling the mega distance of 120 kilometres. Needless to say, there were a few sore backsides in the house, and I don’t think I was the flavour of the month. Saying that, I think all was chuffed with themselves for cycling such a long distance. After a quick shower, it was time for a Chang beer (or two) and dim-sum from the stall outside the hotel entrance. A well-deserved rest day in Surin. We all had different things to do so each set off in their own direction. What a lovely day of cycling we had. As always, we followed small roads past rural villages where cattle had the right of way and were kept in the front yards or under the stilted houses. Old ladies worked the fields while men collected animal feed. 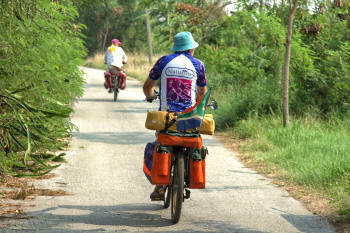 We cycled past rice fields and small settlements where the main junction is still a water well. The road abruptly ended at a railway line, resulting in us having to carry our bikes across, not an easy task. On arrival at Buri Ram Forest Park, we pitched our tents under a covered area. 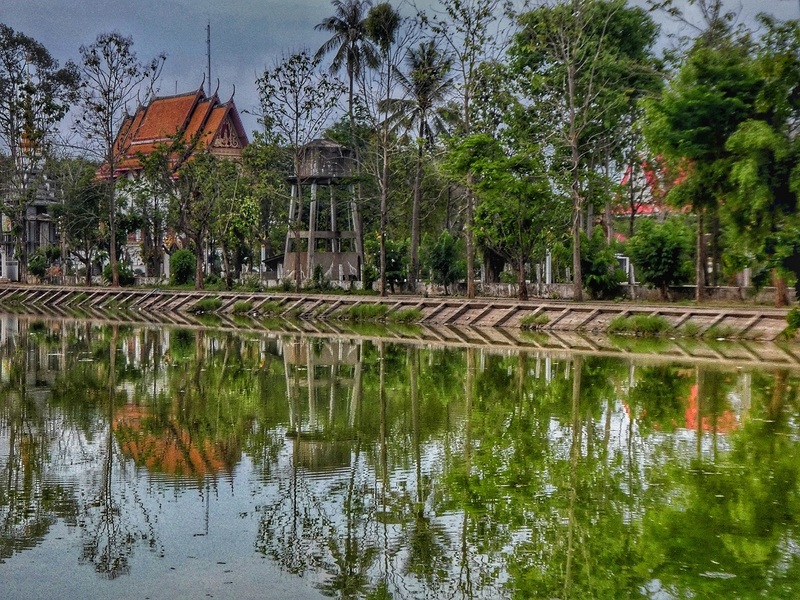 Although there was no electricity, there were clean toilets where we could wash.
Buri Ram Forest Park consists of an extinct volcano that rises 265 meters and is home to the Devil Yoni Tree found only in volcanic areas. Chris kept the fort while Janice and I walked up to the top and came down the 297 Naga raj steps, which have Buddha statues in various poses along the way. We left on a heavily overcast morning, which made for easy biking. 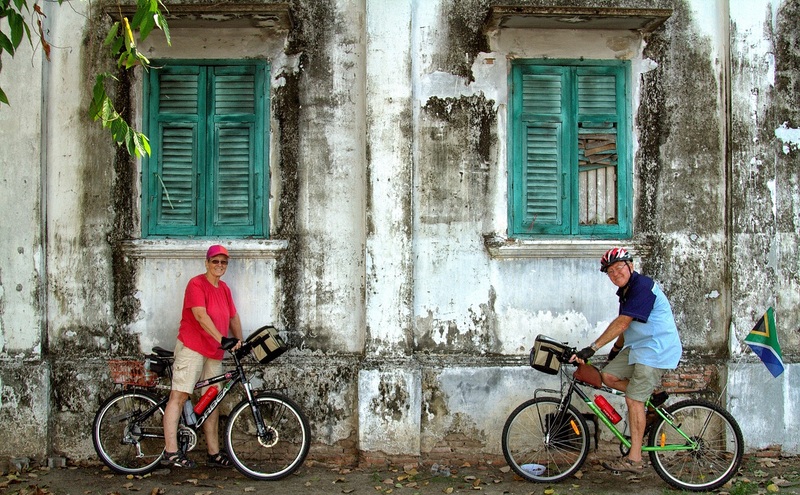 It was a fun day of cycling, and what I consider real cycle touring. 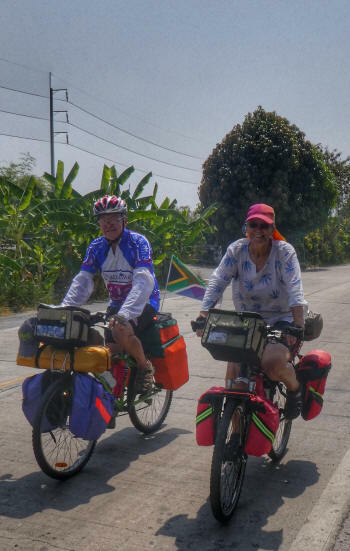 We turned off to visit the Phanom Rung Historical Park, and as it is located up a steep hill, I left my panniers at a shop at the start of the climb and cycled past Janice and Chris, who were both huffing and puffing up the hill. They were not amused! I did, however, mention the night before that we could leave our panniers at the shop or take a lift to the park if we so wished. We had a good laugh at the silly situation as we strolled around ruins dating back 1,000 years. The park is located at the top of an extinct volcano situated 400 metres above sea level. It is assumed that the buildings were constructed in the 10th to the 13th century. It was also a Hindu shrine dedicated to Shiva. Karma nearly got me as it became slightly cold up on the hill, and I did not have a warm top with me. Phew! I almost had to ask to borrow a long-sleeved sweater, LOL. Once back to our original route, it was a short five-kilometre ride to Ban Khok Mueang where we asked to sleep at the local temple, Wat Prasat Buraparam. We swept and cleaned the platform where they indicated we could camp. Janice and I then walked across the road to visit the Ancient Prasat Muang Tam. We had the ruins all to ourselves as all visitors had left, and we were the only people there. So, we had fun exploring the ruins and photobombing each other’s photos. However, hunger pangs drove us back, so we found an excellent noodle soup restaurant. We were up before the monks, but our packing up woke the temple dogs that started barking continuously. By the time the monks began beating the gong, the dogs were in full swing and went from barking to howling. What a racket! Our early start made for a lovely morning ride. 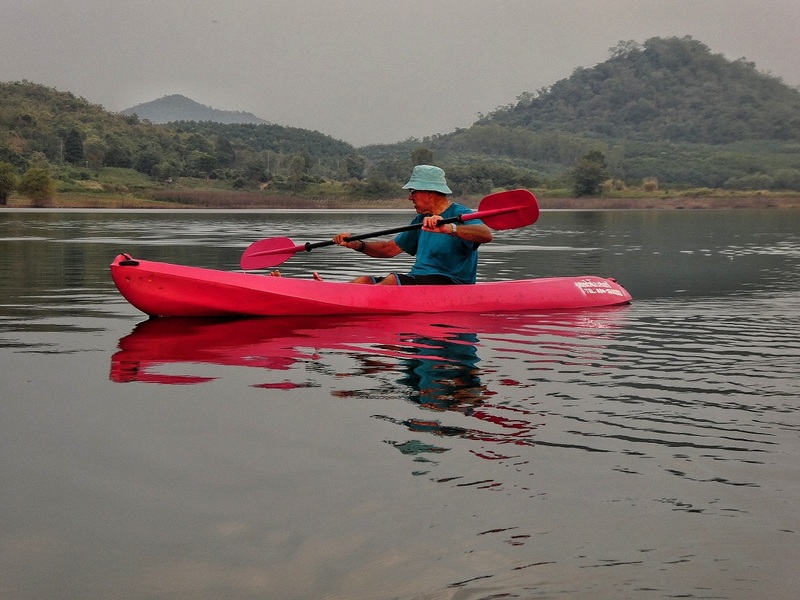 Our plans were to camp at Lam Nang Rong Dam, but we got there so early that we decided to continue to Ta Phraya National Park. Once over the mountain, we stopped at the park where they allowed us to camp. The food stalls were, however, three kilometres down the road, so we cycled on. We saw not only the food stalls but also a Wat to camp at. Wat Mai Thi Thavorn looked slightly forlorn, but we still asked if we could sleep there. The monks pointed us to a structure on another side of the property. The hall was dirty and dusty, but we swept and mopped for hours on end. We cleaned the Buddha, washed the floor, lit a few incense sticks, and in no time at all the place was transformed into a very usable hall. The monks must have been very impressed as they kept bringing us water, extension leads, and even toilet paper! Wow, that was a first! Before sunset, we cycled to the food stalls where we got drinks and food for the night. As was our habit by then, we woke at five and were on the road shortly after six. It was an overcast day with a tailwind that made for easy riding into Aranya Prathet where we planned on having a rest day. The previous day I broke a spoke on the back wheel of the bicycle and needed to have it replaced. We found a reasonably priced room at Aran Garden Hotel 1, which is especially convenient for bicycle travellers as one can cycle straight into an undercover area. It was time to do laundry and catch up on a few outstanding things before hitting the streets for our evening meal. We also stayed the following day and did little repair jobs and stocking up on essential stuff. 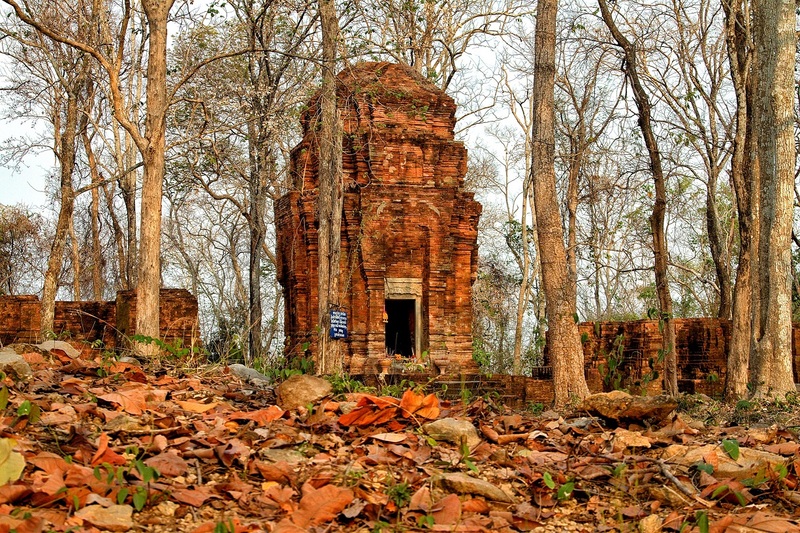 Our first stop of the day was the ruins of Prasat Khao Noi. 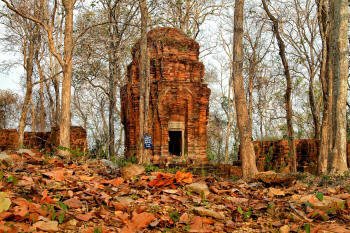 The ruins (a Hindu Shrine) are located on top of Khao Noi, a limestone hill. Originally, the sanctuary consisted of three prangs, of which only the one in the middle remains. One of the lintels discovered here dates back to the 7th century. Excavations done here revealed interesting artefacts as well as a stone lintel with inscriptions dating back to 637 AD. The lintel was, most likely, reused. As we cycled away, we cycled right through the Sunday market, which was somewhat unusual. Along the way, we took to picking up seeds from the various trees along the way. Upon closer inspection, they turned out to be quite fascinating, and each one unique. Some were light and fluffy, others sticky or thorny, and some seeds were even inside a rather solid shell that popped open with a tremendous bang and shot them a fair distance away. 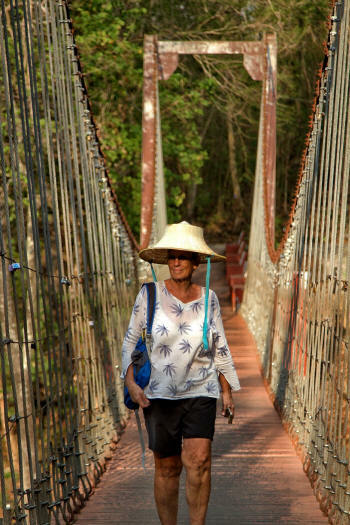 Eventually, we arrived at Khao Chakan Forest Park where we explored some of the caves. We were able to walk up a rather steep flight of stairs to a large hole in the mountain with a magnificent view of the countryside. The park would have been great camping, but the thousands of monkeys made us look for alternative accommodations. At first, we cycled around looking for a room but could find none. Eventually, we pulled into a restaurant where the map indicated an accommodation. There were no signs in English, but we found an extraordinary resort, also known as the Bus Resort. 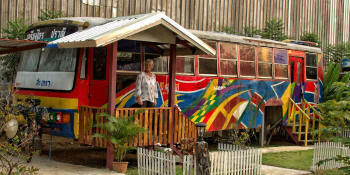 It consisted of buses converted into overnight accommodations all fitted with air-conditioning, fridges, and bathrooms. They were rather comfortable. That night, we ate at their restaurant, and the food was terrific. It was another wonderful day on the road. The path winded over the hills and through Khao Ang Rue Nai Wildlife Sanctuary, where we saw plenty of fresh elephant dung on the road but, unfortunately, no wild elephants. 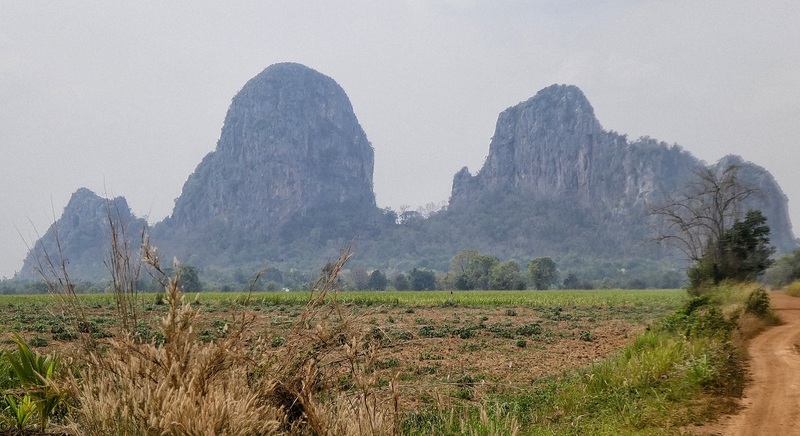 Once we were over the mountains, it was a downhill ride to the small town of Khlong Takrao. I had plans to camp on the opposite side of the dam and thought of taking a shortcut via the dam wall. On arrival at the dam, we found it had flooded and had to cycle around the dam, making for a much longer day than expected. 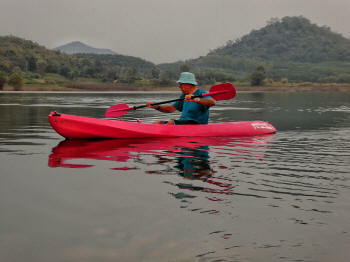 We did, however, find a beautiful campsite at Sronlai Homestay, where we could also rent canoes. Soon, as the sun started heading for the horizon, we paddled out and had a most relaxing paddle around the dam. What a marvellous day of riding it turned out to be. 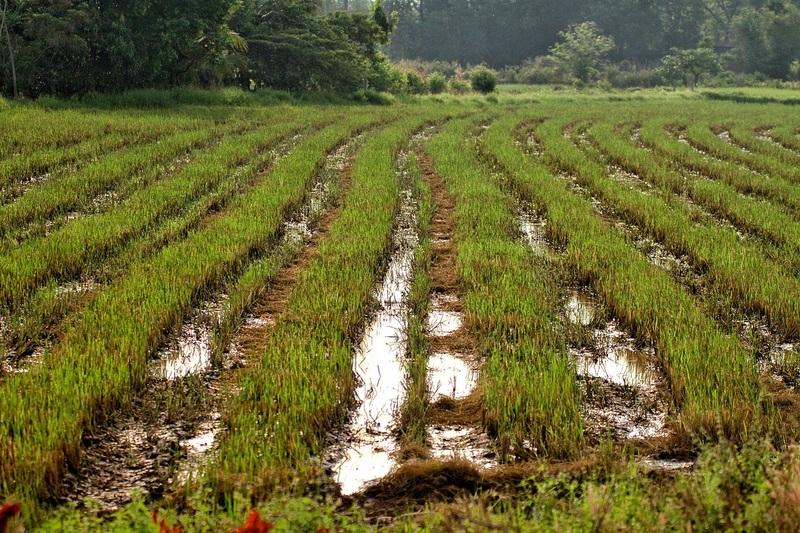 We followed country roads past rubber tree plantations and farmers preparing rice fields. We stopped at temples located atop a steep flight of stairs and admired not only the view also a dark room with many Buddha statues tucked away. 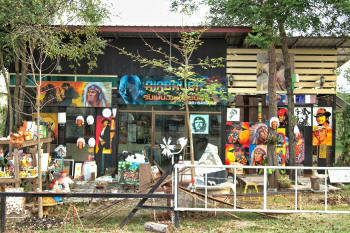 On cycling into Phanat Nikhom, we spotted the sign of the weaving market and factory. We spent some time looking at the remarkable work and the largest hand-woven baskets in the world. Then, it was off to find accommodation, which we did at a temple outside the city. It was a busy temple with far too many temple dogs. A few broom and feather duster salesmen also pulled in to overnight at the temple. They were very well organised with sleeping mats and even fans and cooking equipment. It was a rather noisy night, partly because the dogs went ballistic every time someone went to the toilet, and partly due to the Wat being on a busy highway. The temple had large grounds, and during the night a few trucks also pulled in to sleep. From early morning, there was revving of lorries, beating of gongs, dogs going wild, and the general noise from the highway. We packed up, waved goodbye to the feather duster salesmen and monks, and set off with the temple dogs in tow. It took us precisely two kilometres before turning off and finding the most tranquil rural road. We sighed a sigh of relief as we slowly made our way to Chachoensae via small roads. Our small road came to an end as we encountered roadworks, but a super-friendly farmer escorted us on his motorbike by a road that was not on the map. 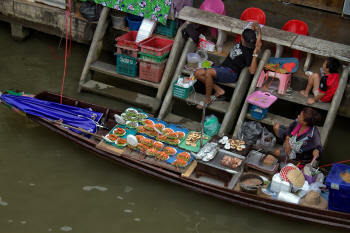 Once in Chachoensae, we headed through the busy city to the old market situated on the banks of the Bang Pakong River. It is said that the market has been run for over 100 years. Unfortunately, the market was closed at the time, and all we could do was wander around admiring the old wooden structures. As is the custom, some people live and work here, and we found them extremely friendly as they invited us to sample their specialities. We had a coffee at the little coffee shop overlooking the river and then went in search of accommodation. The previous night we decided to take the train into Bangkok instead of cycling into the city through heavy traffic. As there were a wide variety of trains to pick from, there was no hurry, and we could cycle to the station at leisure. I woke to a flat tyre and as Janice and Chris were already packed and ready to go they cycled off while I fixed my puncture. Upon our arrival at the station, however, Janice and Chris were not there. Somehow, they cycled to the bus station about one kilometre north of the station. Eventually, they arrived, and we were on our way to Bangkok. 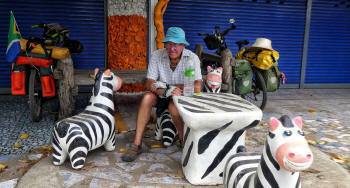 From the Bangkok railway station, it was a short six-kilometre ride to Banglamphu and to the Bamboo Guesthouse where we left their bike boxes. It was, as always, an unsatisfying way to end a cycling trip, but the traffic was far too hectic to try and cycle into the city centre. I took a canal ferry to the centre of town to collect my new passport from the embassy, just to find that it was a South African public holiday and that the office would only reopen on April 3. 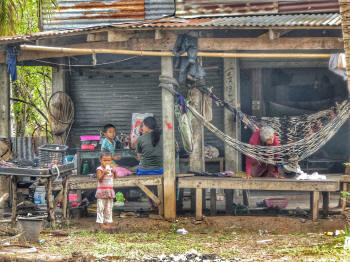 I took a walk around the shops and eventually walked all the way back to our accommodation in Banglampu. I then cycled to Bok Bok Bike where I handed my bicycle in for a service and to fit two new rims as well as a new front fork. My front luggage rack was broken and was being held together with cable ties, which was not a very stable repair job. A rack for a fork with shocks is a rather difficult item to get a hold of, so I decided to go for a fixed fork instead. This made finding a rack much easier. I expected this all to cost a pretty penny but there was not much I could do about it. In the meantime, Janice and Chris packed their bicycles back in the boxes for flying home, but we still had a good few days to explore Bangkok and the surrounding area. That evening, we took a walk to the Gecko bar for a beer, and in the process met up with Tania as well as Rodd, an amiable guy from New Zealand. The previous night we arranged with Rodd to join us for a day’s excursion to the Samut Songkhram Railway market and nearby floating market of Amphawa. We had an early start and caught a taxi for the short ride to Wonwian Yai Station where we found the train tracks in the middle of the road. We boarded the train to Maha Chai station for only 10 TB. 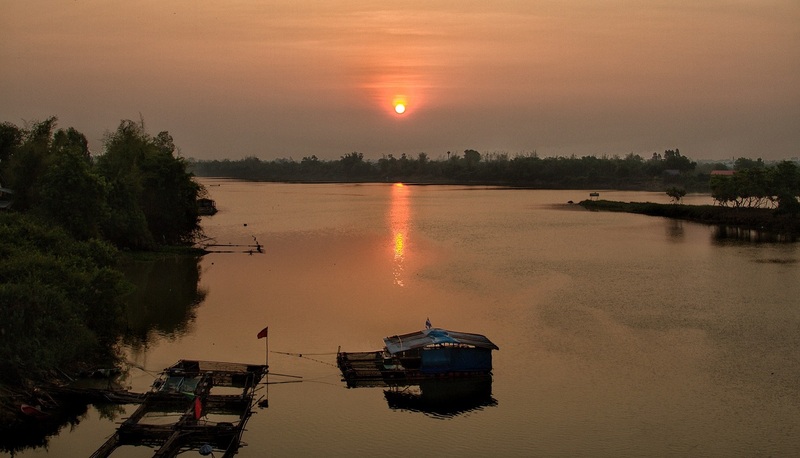 Once at Maha Chai station, we found that we had to catch a ferry across the river as there was no train bridge; again, the fee was a mere 3 TB. A short walk brought us to Ban Laem Station from where it was another 10 TB ride to Samut Songkhram. The Railway market is quite an extraordinary place where the market spills over onto the rail tracks, leaving no space for a train. Once a train approaches, the traders quickly pick up their wares. This allows the train to pass, and once the train has passed, everything gets put back in place, and trading continues as if nothing happened. We had a quick bowl of noodle soup and then caught a Songthaew (or Baht Bus) to the Amphawa Floating Market. We arrived in Amphawa at midday, and as it was still sweltering hot, we opted for a canal tour at 50 baht per person. The trip took more than two hours, so on our return, the weather was much more bearable. Now we were able to walk around and sample all of the food. Later, we returned to Bangkok by minivan and headed straight for the Gecko Bar for a beer. Together with Rodd, we caught a bus to the Chatuchak Weekend Market. As always, I spent more money than I had intended to, but the stalls are all so interesting and inviting. After walking for hours, we eventually sat down for an iced coffee before catching the bus back to Banglamphu. 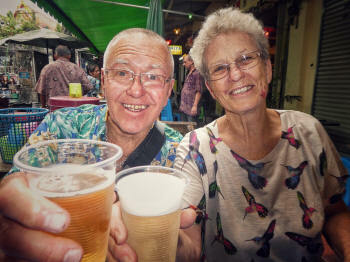 As usual, we went in search of a 70 TB beer, which we found right on Khao San Road. Here, we sat on small plastic chairs outside the 7-11 and watched the world go by. Janice and I went in search of a precision tool for her art projects but could find none. I, however, found a map of both Thailand and Southeast Asia, something I had been seeking for some time. Meanwhile, Janice bought me a camera backpack as a thank you gift. I was somewhat embarrassed by this very generous token of appreciation, but at the same time, I was over the moon about my present and had it on my back for the rest of the day.